I wouldn’t call myself a Mac geek, fanatic, or cult member, since I have only owned a Mac for less than a year, but in the interest of full disclosure, I will say that I have been a fan of Apple for many years, have wanted to own a Mac for most of that time, and am typing this on a Mac right now. I have been to the Apple store in the SoHo section of NYC several times for shopping, browsing, presentations, and once for support. It’s a very nice store, with wide open areas, a large array of products, and you can tell that it was designed with nice balance of both form and functionality. It really is different than most retail stores, but in line with the style that most large SoHo stores in the area have. 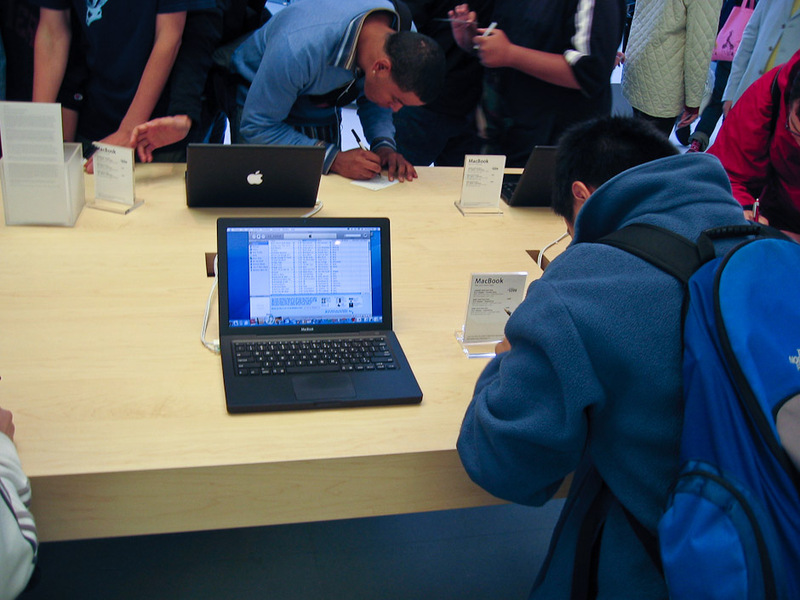 One thing that I really like about the Apple store is the employees and the attitude they have. They will ask you if you need help, but if you say, “No thanks, just looking,” they will leave you completely alone. They are friendly if you let them, and quiet if you want them to be. Another cool thing about the store is that they have instant check-out for products that are available on the floor (i.e. external hard drives, mouses, iPods & accessories, books, etc.). Employees have little hand held scanners that will scan the item you want, and scan your credit card to complete the transaction. You can be out the door in less than five minutes without waiting on a line. Very cool. 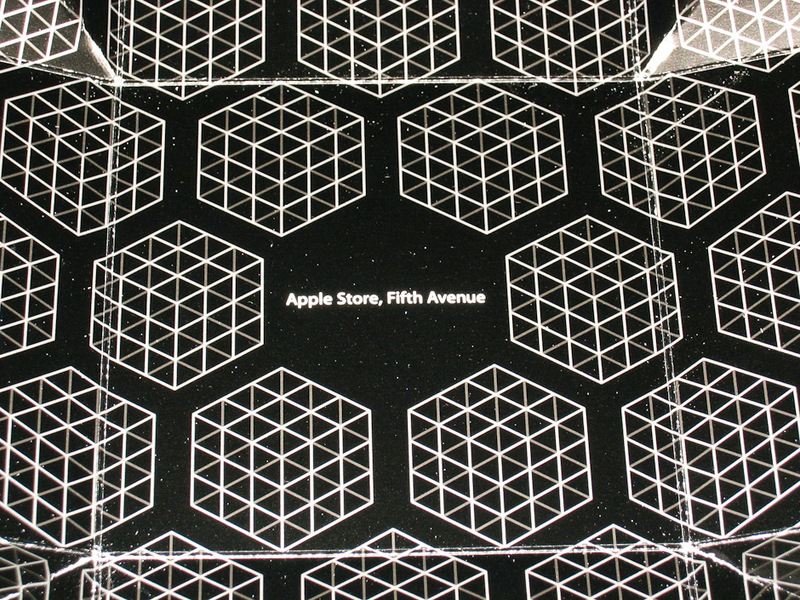 For a long time now, everyone in the Mac community in NYC has known about Apple’s plan to open a “flagship” store at the GM building on 59th Street and Fifth Avenue, right across the street from the old Plaza Hotel and a block away from the entrance to Central Park. This location is interesting to me because it is not necessarily the type of location that I would associate with the image that Apple has. The SoHo location is a no brainer. SoHo is a very trendy part of town and is home to many, many trendy stores like Kate Spade, Steve Madden, D&G, Marc Jacobs, and Prada, as well as countless designers that I wouldn’t know about. In short, SoHo is a shoppers paradise for the young and hip. 59th and Fifth is almost in stark contrast to that. Tiffany’s, Bergdorf Goodman, Coach, Van Clef and Arpels, Burberry, and Bulgari (Bvlgari) are just a few of the stores in the area. 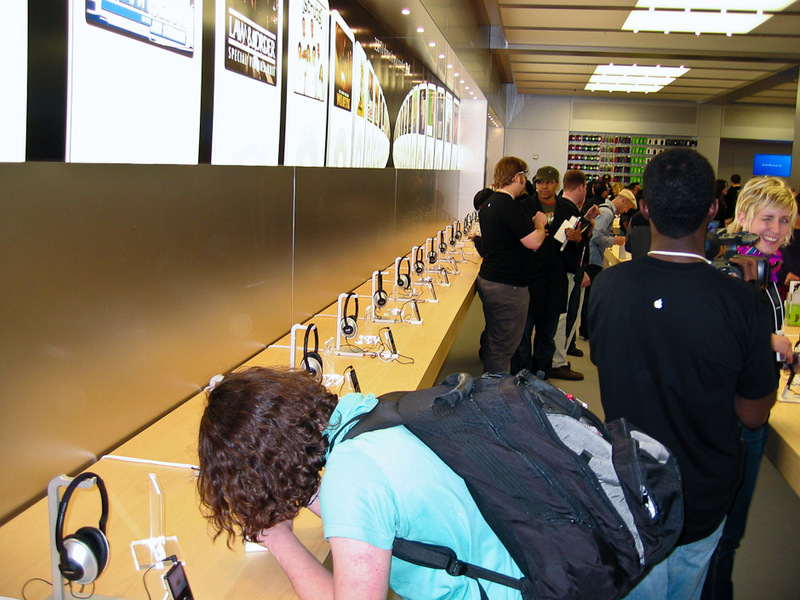 Not exactly the type of stores that attract the young and hip, which is the image that most people have when it comes to Apple’s core customers. “Artists and creative people” generally do not shop at Bergdorf Goodman, although Bergdorf Goodman, I’m sure, will not turn away their money. The GM building at 59th and Fifth has undergone a lot of changes recently. After being acquired by Donald Trump in 1998, the large auto showroom on the building’s north side was closed and became the studio for the CBS Early Show. A large “TRUMP” in gold letters adorned the front of the building and smaller “TRUMP”s were to be seen at almost every corner. In 2003, the “TRUMP”s came down as developer Harry Macklowe bought the building. It was his plan to build out the Madison Avenue entrance for shops, as well as create an underground “arcade” of shops, similar to Rockefeller Center (albeit on a much smaller scale). The story goes that his people called Apple’s people and told them of the plan, and that they wanted Apple to be a part of it. When Apple’s people asked where the space was, Macklowe’s people responded that the space was underground. 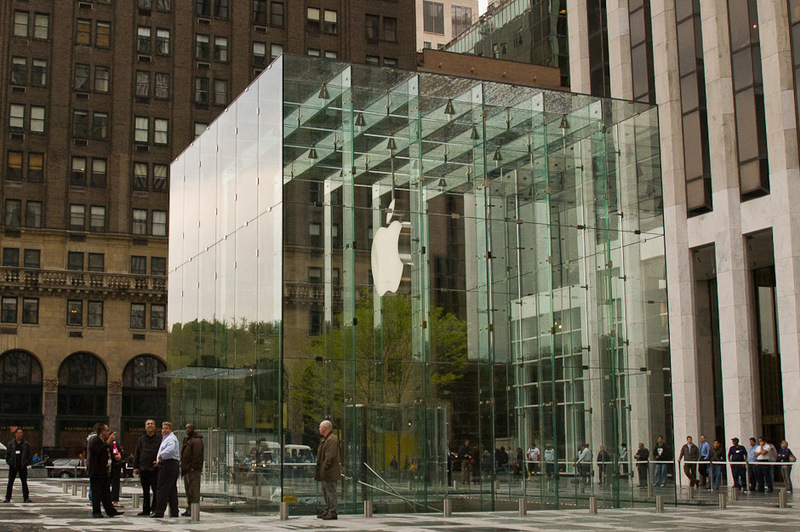 Apple’s people had a hard time with that, but came back and said that underground would be okay if they could build a giant glass cube 32 feet high on top of the plaza, emblazoned with Apple’s logo. 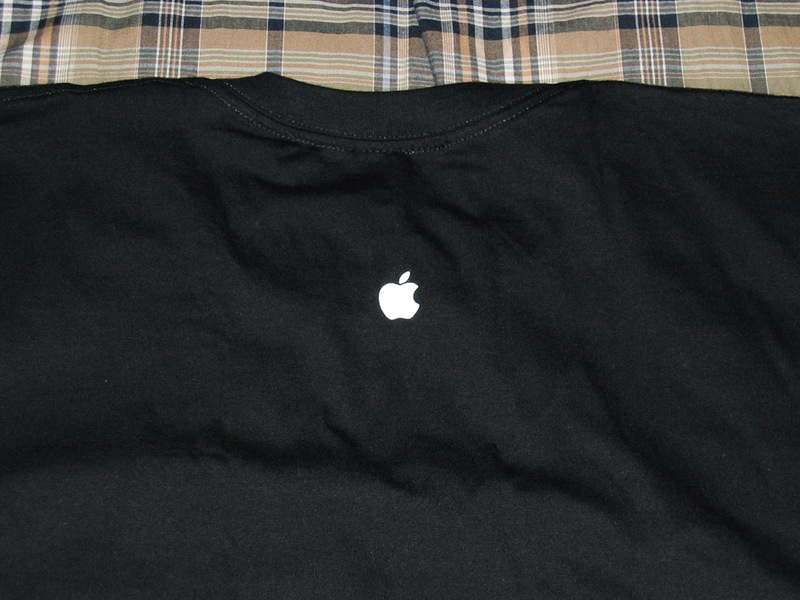 Macklowe’s people must’ve thought something along the lines of, “We can charge them more rent for that! 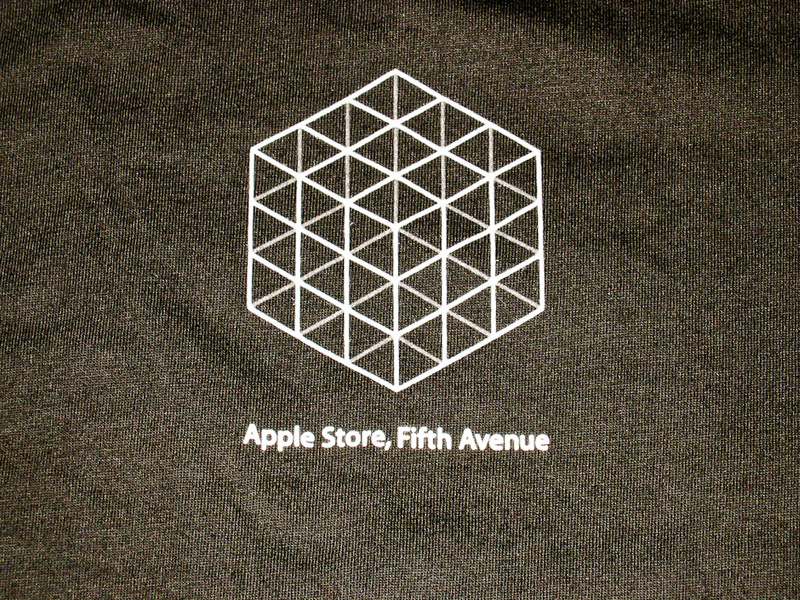 Steve, we would love the cube!” And thus, the store, and The Cube, came to be. 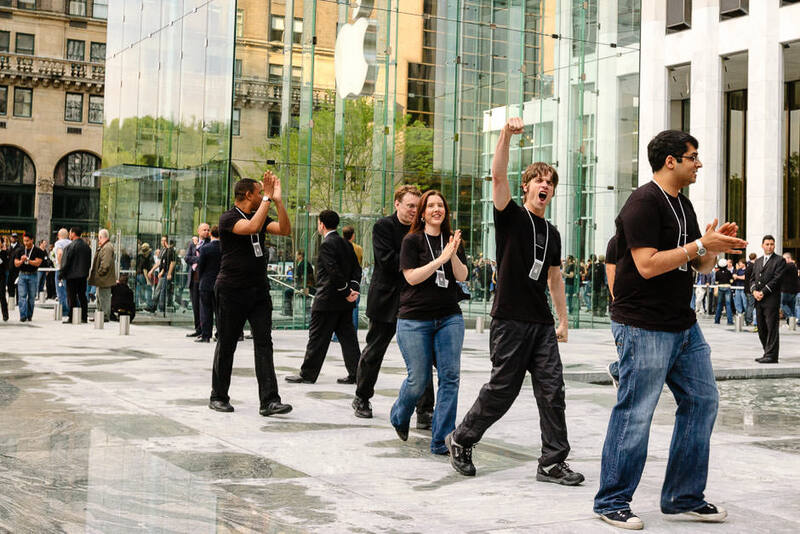 On May 11 I got an e-mail from Apple saying that the “Apple Store, Fifth Avenue” would have it’s grand opening on Friday, May 19 at 6 p.m. An odd time for a grand opening, but I don’t work in retail, so what do I know? 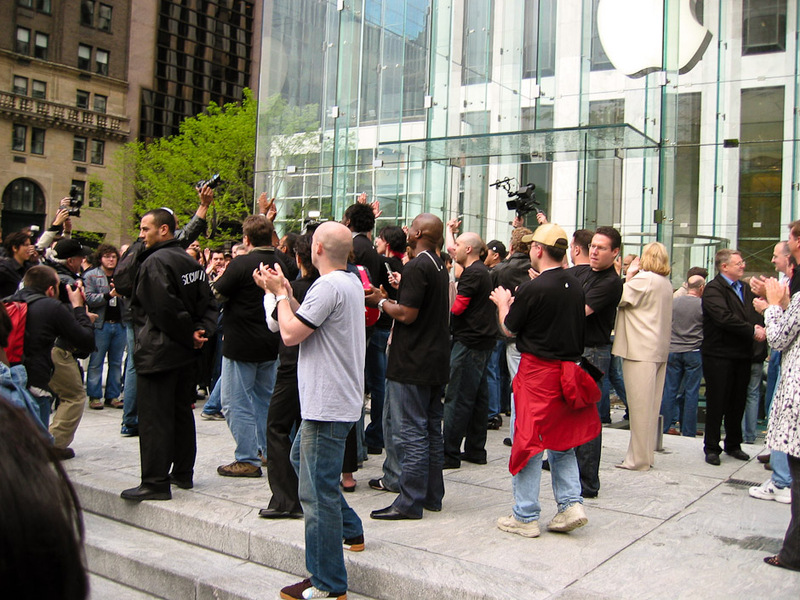 I had heard that Apple Store openings were fun events and that people would line up for hours or even days to be the first ones in. 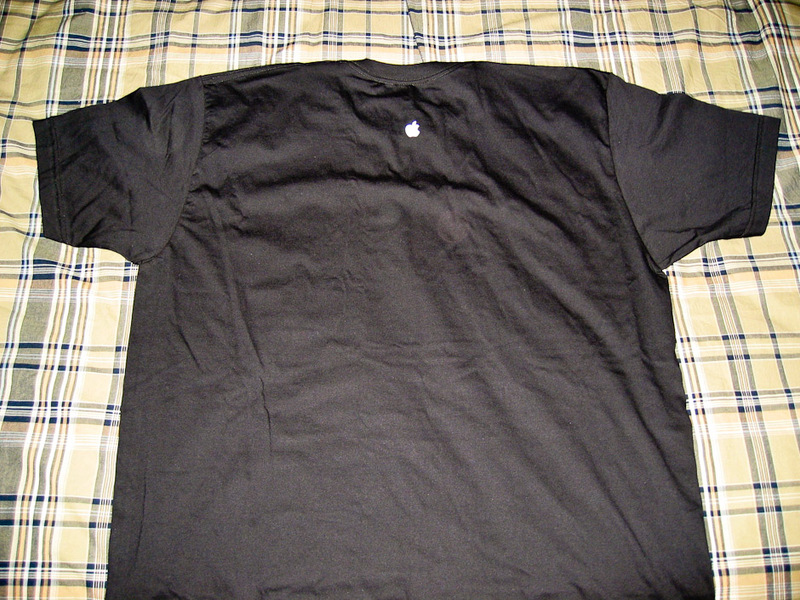 They give away t-shirts and other Apple swag to the first few hundred people, and they are almost social events. Since this store was only about 10 blocks from where I live, and two from where I work, this is about the only store that is going to open any time soon that I would be able to go to the opening of conveniently. The problem is that I rarely leave work by 6 p.m., even on a Friday, and the line by that time would be several hundred long. So my thought of going to the Apple Store opening quickly vanished from my mind (like a lot of things). In the movie Field of Dreams, Kevin Costner’s character talks about a time when all the cosmic tumblers fall into place, and the universe opens itself up to you. Well, not all of the cosmic tumblers fell into place for me, but maybe, just maybe, one tumbler partly did. For some unknown reason…call it fate, call it luck, call it karma…I had to do a hardware upgrade on some systems at work, and it was scheduled for Friday, May 19. Since I work for a law firm, we are not allowed to perform intrusive work until after 11 p.m., which means that I would have Friday off during the day, and wouldn’t need to be in the office until about 10 p.m. Hmm, now what should I do with all that free time? I woke up around 10 a.m., sat in the living room, had coffee, and watched The View for a few minutes (My God! Star Jones has lost a lot of weight…I mean she’s lost like two people!). Got sick of it really quickly (because I’m straight), and flipped around for a bit. Heard a big thunderstorm outside and decided to wait it out before heading over to the new Apple store. The storm ended some time after noon. It was then that I decided to go. I showered, got my camera gear ready, and headed over to Fifth Avenue. I got to the store around 1:30 p.m. and found the line. It started in the middle of the block on Fifth Avenue, and went towards 58th Street. When I got in line, it had just hit 58th Street and just started to turn back on Fifth Avenue towards 59th Street. The ground was dry and there was room between the metal gates that lined the snaking line, so I was able to sit down and lean up against the metal gates. I pulled out a pile of resumes that were submitted for a job opening I have, and proceeded to go through them. I found about 10 that I might want to see, which is a pretty good number. The entire time that I was leaning against the metal gate, other people were as well, and as a result, the metal gate started moving back. We tried a few things to steady it, but it was no use. We all sort of gave up on leaning against it and opted instead for the Indian position. Right behind where I was sitting was another path for the line to snake through, and beyond that, right against the curb, was a small “shack” made from poles and clear plastic tarps. Inside were two people, a table, chairs, and more than a few MacBook Pro’s. On the upper-front-right corner of the shack was a small angled bracket, and attached to that, in a plastic housing, was a still camera pointed towards the store. Due to my vast knowledge of cameras, lenses, and the like, I could tell it was a wide angle lens and that from it’s vantage point, it could easily see the cube entrance to the store, and quite a bit of the line, but not of me. A little while later, my section of the line had filled up, so they started filling the line that would be behind me in the snake. It was at this point that someone tried to roll past on a Segway. Of course, as you would guess, he hit something and went flying. Serves him right. Why he would use a Segway to stand on line is beyond me. My only guess is that if you spend $3000 on one of them, you need to use it as much as possible to justify the expenditure. Sort of like if you buy a tuxedo, you wind up using it a lot more than if you still needed to rent one. A person who claimed to be from Apple started handing out little slips of paper with numbers and a picture of Mickey Mouse on them (Steve Jobs is Disney’s largest shareholder, by the way). “In case you need to get out of line,” was the reason. 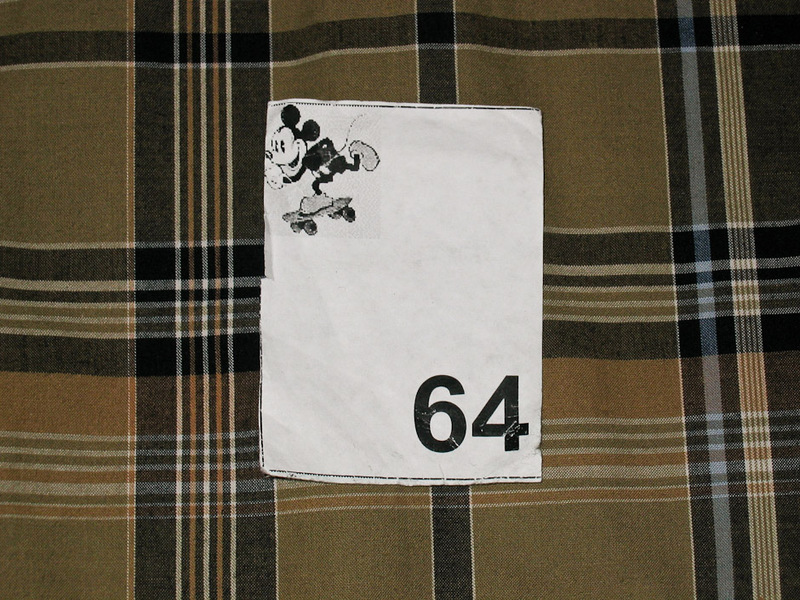 I got number 64. Around 2:45 p.m. or so, the sky started to get very dark. Uh oh, rain coming. I stood up, got the umbrella ready, and then the rain started. At first it was a little bit more than a drizzle, but then the sky opened up and a torrent of water was unleashed. The only thing the umbrella did was keep the top of my head mostly dry. Everything else was soaked. Everything. Several people behind me in line bailed during the rain. No one in front of me bailed, and my guess was that most of them braved the earlier rain, so this little bit was not going to deter them. The rain, strange to say, brought people together. In case you don’t know it, New Yorkers are strange people (according to the rest of the country). We generally like to keep to ourselves around strangers, but once the ice has been broken, we’re as friendly as everyone else. I always find it weird how friendly people are to strangers in the rest of the country. As an aside, I was in Virginia once, and strangers would say “Hello” to one another while walking down the street. In Vegas, strangers say hi to each other in the hallway of the hotels. Very uncomfortable for me. Anyway, strangers huddled together and made little umbrella “forts” to try and keep dry. One group of about six had a good fort going for some time until one person’s Nautica umbrella collapsed and poured water all over the guy in the center of the fort, who, up until that moment, had been the driest person on the line. I guess the rain is an equal opportunity offender. After about 45 minutes of rain, it slowed to the point that the umbrella could go away. At this point, the ground was a small river, so standing would be the main mode of waiting on line for the next little while. After the rain, we all had something to talk and joke about. Everyone was soaked and it was almost a competition to see who’s shoes made the most “sloshing” sound. As soon as the rain was over, everyone who brought their Apple notebooks, broke them out and started surfing the web and watching movies again (thanks to Apple for providing free WiFi access to the entire plaza). There was one lone Windows laptop in the area around me, and he kept getting jeers from everyone. Good thing I kept my day job under wraps. It was about this time that we heard how long the line was. From the report, the line went from 58th and Fifth (where we were) down 58th to Madison, up Madison to 59th Street, up 59th Street back to Fifth Avenue, across the street and back down 59th Street to Madison, and up Madison to 60th Street. I don’t know how many people that is, but it’s a lot. According to Google maps, it works out to be about half a mile! 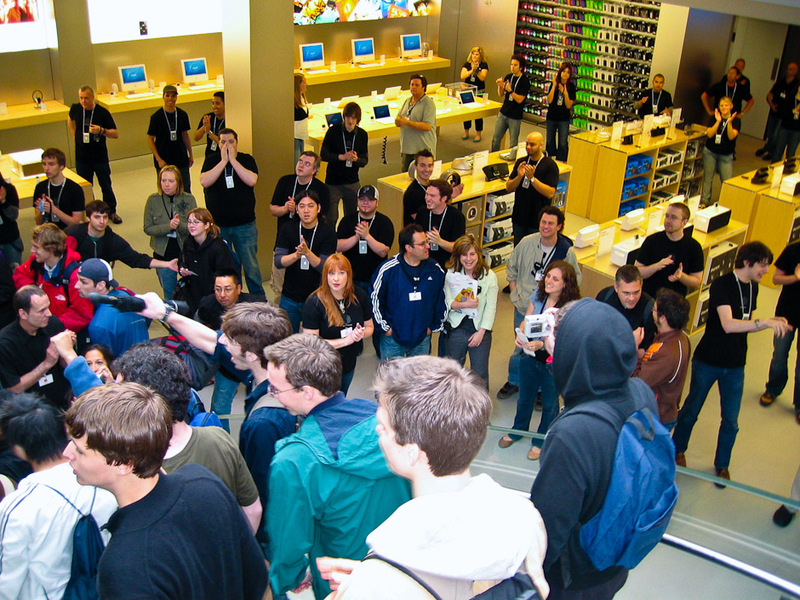 At about 5:30 p.m., employees of the store streamed out and started to try and get the crowd revved up. It worked for a few minutes, but everyone was a little cold since the sun wasn’t out and some of us were still wet. Various camera crews went around and interviewed people, and then at 5:59 p.m., the employees started counting down from 60. That’s an annoying countdown, by the way. At 6 p.m., they moved the gate at the front of the line, and the first few went in. The line moved, and I was at the front within two minutes. I went through the door of the big glass cube, and started heading down the glass staircase. 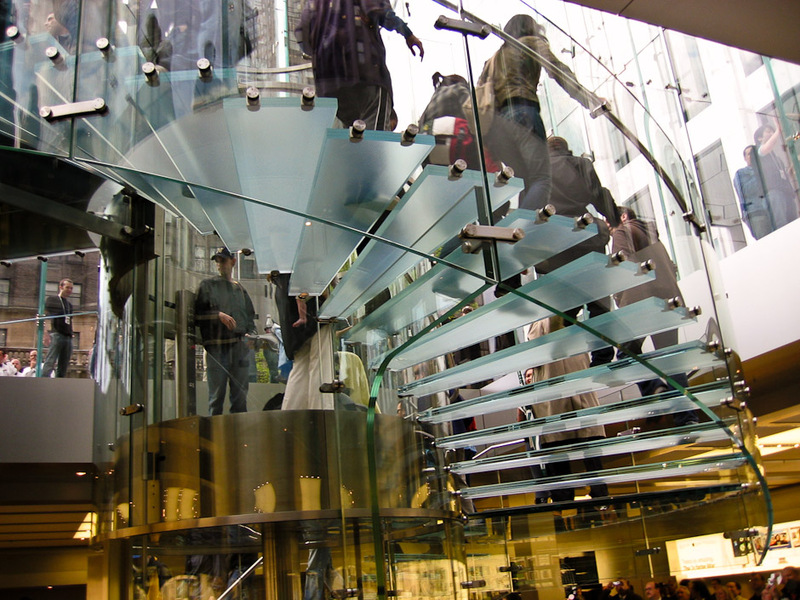 The stairs are like the stairs in other Apple stores, except that they are curved around the glass elevator in the center of the cube. All the employees were clapping and welcoming everyone. That is just one of the reasons I could never work in retail. 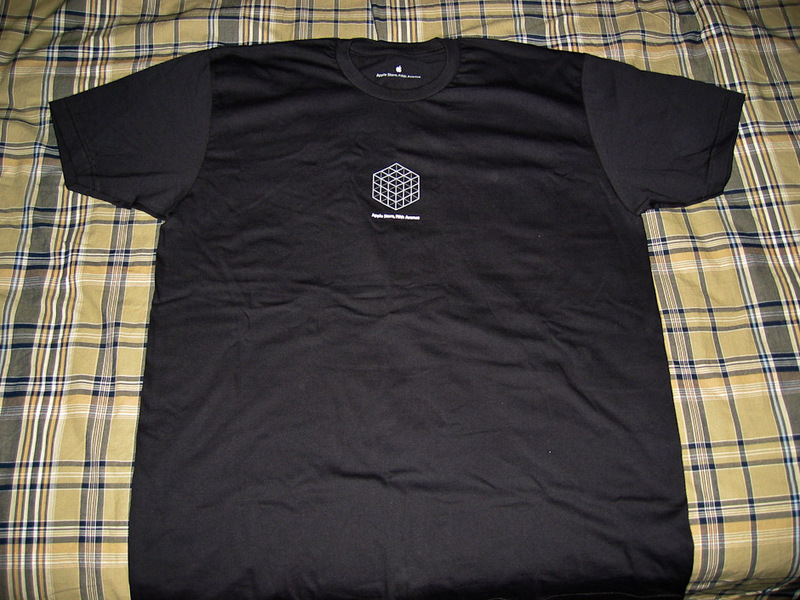 I got down to the floor and was handed a box containing the promised t-shirt, and an entry card for the sweepstakes. They were giving away one notebook computer an hour for the first 24 hours. Everyone ran over to the closest table and started filling out the cards, totally disregarding the computers that were set up for playing. After filling out my card, I checked out the new black MacBook, with it’s glossy screen and distinct keyboard. Very nice design and specs (they surprised me by using a Core Duo), but it’s probably too slow for my next Apple purchase (shared video RAM which makes Photoshop and other graphic intensive apps choke…but that’s for another day). 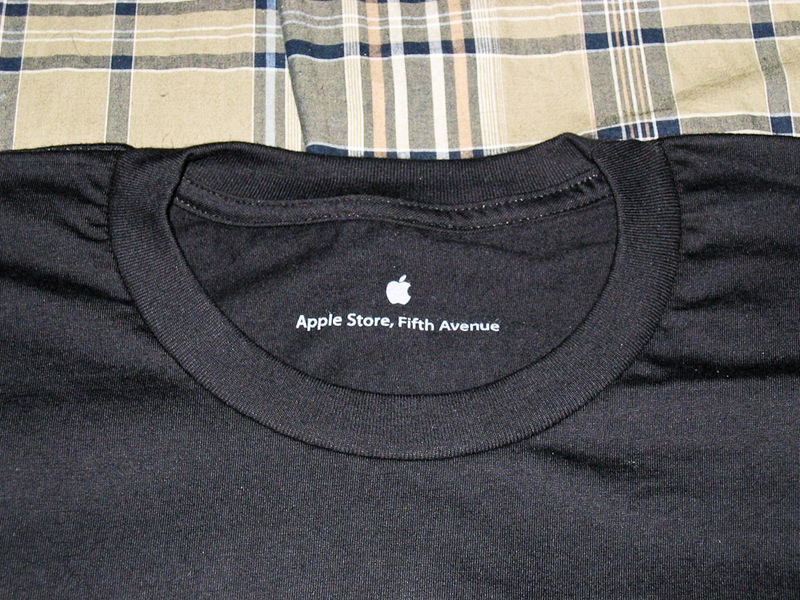 I walked around the store, looking at a few things, but let’s face it…once inside, it’s like any other Apple store…and since the experience of being one of the first in, and scoring a t-shirt, were the main reason for going, it was time to go. Most of the people in line around me were between 16 and 25, but then again, people my age, and older, generally work for a living (there are exceptions, of course). There were some older and some younger, but for the most part, I felt a bit old. There was one couple that had brought their baby, who, by the looks of the thing, was about a year old. They got to ride in the glass elevator due to the carriage. There were some “colorful” characters as well (what New York line wouldn’t be without them?). There was this one bearded guy in train engineer overalls. He sort of looked like Dr. John. There was the previously mentioned guy on the Segway. Another guy was walking around the line with his new black MacBook open, pointing with the screen and keyboard away from him, as if to say, “Look at my new toy, aren’t you jealous?”, but then we all realized that he was using the built-in iSight camera to take a digital video of the line. I would like to say that most people on the line were normal, but then I think about the fact that we were all waiting on a line for a computer store to open and get a t-shirt. In short, there was not one normal person on the line, but some were more normal than others. What do I think about “The Cube”? First off, The Cube is reported to be 32-feet tall by 32-feet wide, and made entirely out of glass except for the steel bolts that anchor each large pane to the others around it and to the glass support beams. It has a glass staircase that spirals around a glass elevator in the center of The Cube. It was reportedly designed by Steve Jobs himself and to cost about $9 million. 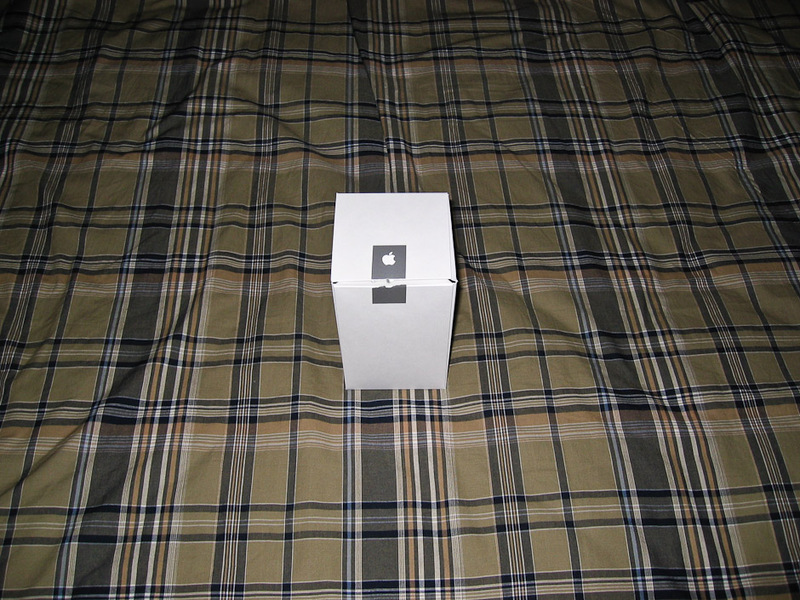 One of the sticking points to signing the 20 year lease that Apple has with Macklowe for the space, was that Apple wanted to be able to take The Cube when the lease was up, but that Apple would replace it with a similarly designed cube. 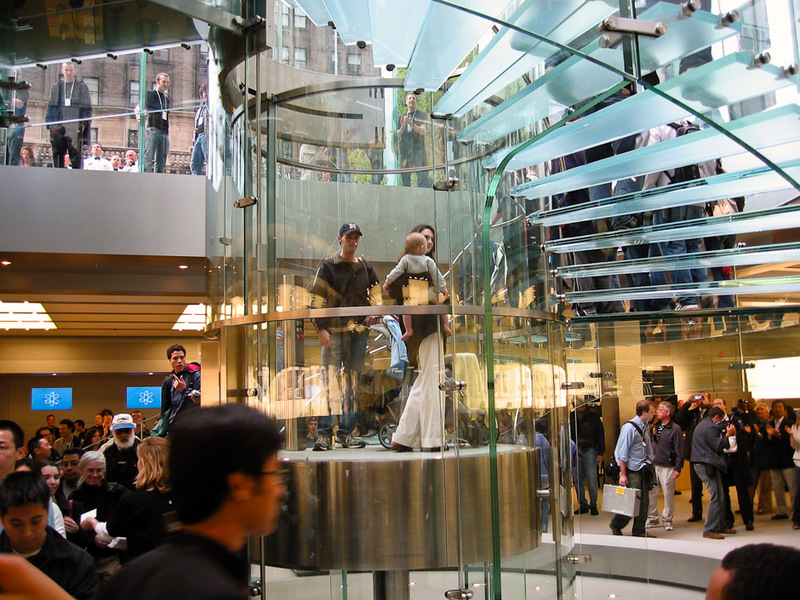 Being that The Cube has a glass elevator, and noting how Steve runs Apple with an almost totalitarian grip, the comparisons to Willy Wonka have been floating around with zeal. All that was missing was Steve coming out of The Cube with a limp and a cane, only to perform a somersault near the beginning of the line. I have walked by the GM Building many, many times since it’s right near the entrance to Central Park, and was on my way to work for several years. It’s also dominates the view from my office. The GM Building was built in 1968 and has a very dated, World’s Fair, feeling to it’s architecture. It pretty much feels out of place next to the art deco styling of the Bergdorf Goodman building to it’s left, and the classic Sherry Netherland Hotel to it’s right. 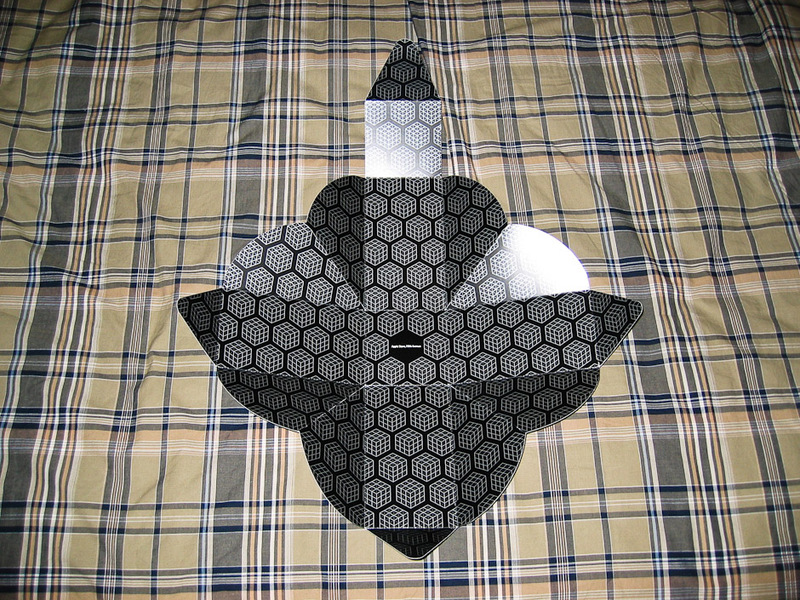 In all honesty, it sort of looks like a seersucker suit. One thing that I really like about Manhattan is that the architecture is very varied. Because of how old New York is, there is a great mix of building architecture, running from the 1800’s right up through today, sometimes even on the same block. As a result, many areas of the city look quite different from each other, and because the city is always changing and always being renewed, the architecture of an area rarely stands still. The Cube adds a modern touch to the plaza in the front of the building. Because it is made of glass, and has a very minimal support structure, it doesn’t really disturb the original design of the building, but rather modernizes it, something that it was in need of. 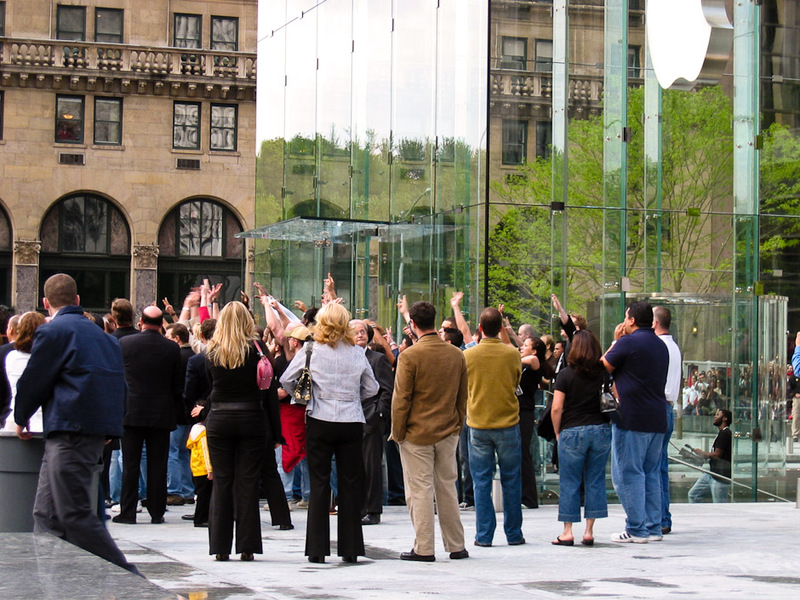 The original plaza was stuck somewhere between classical and modern architecture, and the Apple cube, at least, tipped it in one direction. Purists will say that the plaza should not have been changed in any way, but if you ask me, it’s a fairly minimal change to the overall feel of the plaza. The change that occurred on the Madison Avenue side of the building is much more disturbing…basically, the entire entrance was replaced with shops, and the facade of the shops do not even match the architecture of the building above them. My view of the Cube may change in time, but for now, I like it. I finally got through with work at about 2:30 a.m. When I got home, I was so tired that I decided to go right to bed. I took off my shoes and socks, and realized that they were still wet from the rain about 12 hours earlier. I guess I was a lot more soaked than I originally thought. As I was lying in bed, trying to go to sleep, I thought about the day that I had had. Would I do it again? Maybe. If I could stand in line with friends, the time would have gone much faster, but that goes for any line in general. Is there something better to do with four and a half hours? Yes. Would I have done something better with my day off? Probably not. I probably would have watched a movie at home and then took a nap. Did I enjoy it? Yes, sort of. I was on line with somewhat like-minded people with a common goal, so it wasn’t like we had nothing to bring us together. It was in that state between reality and sleep that I realized that I stood on line for four and a half hours, didn’t eat, didn’t go to the bathroom, and endured a thunderstorm that would have made Noah take notice, all so that I could be the 64th person into the new Apple store on Fifth Avenue, and all I got was a lousy t-shirt. And a pair of wet socks. Everyone was filling out their cards. That MacBook looked lonely.